The P5 is DEAD! It stands as a piece of 80's music history on the web. To prevent spam, your COMMENTS WILL NO LONGER BE POSTED! Old links may no longer work, and NO we will NOT fix them. The P5 DOES NOT upload, post, host or share music files online. All links on The P5 point to other music blogs and were valid at time of posting. All links on this site were found using public search engines such as Google Blog Search. Please read the disclaimer at the right. 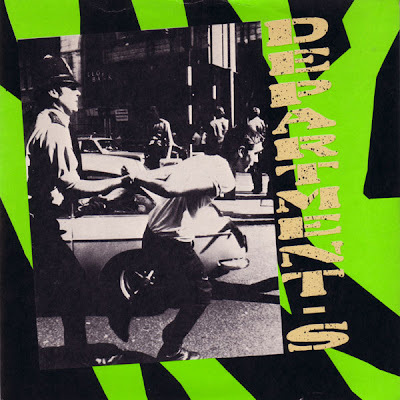 On this date in 1981, Department S released their second single, "Going Left Right". It was backed by "She's Expecting You". The single reached the #55 spot on the U.K. singles chart. The 12 inch single included, as a bonus, a French version of the A side. The London new wave band, during its short lived career released three singles and no albums until a 2003 compilation, Sub-Stance, was released. The department was closed in 1981. The released new material in 2007 without, of course, lead singer Vaughan Toulouse who died in 1991 of complications from AIDS. Huang Chung - Isn't It About Time We Were On TV? The Post Punk Progressive Pop Party (The P5) was a radio show that aired every Saturday night on 88.7FM WVHC (now WRHU) Radio Hofstra University in Hempstead, NY. Back in 1978, it was among the first stations in the U.S. to play the "New Wave" of music that arose from the ashes of Punk Rock. Other college radio stations caught the wave, followed by some major commercial stations like: 101.9 WPIX N.Y, 92.7 WLIR N.Y, 106.7 KROQ L.A, 91.1 91X San Diego, 105.7 The Quake San Francisco and others. This blog is a tribute to all of the great music of that era. We listened on cassette and vinyl, we danced to it at nightclubs, we saw the bands before they were famous, we got weird haircuts, we dressed in strange clothes. We were part of a music scene. That scene is back. It's right here online. Don't be square, be there! *The P5 DOES NOT upload, post, host or share music files online. *We are not an automatic music blog aggregator. *All links work at the time of posting. *We make absolutely NO INCOME from this blog. *We have no affiliation with the original P5 radio show. *We have no affiliation with the music blogs that we link to. *Some of the music found here is out of print. *Some of these bands no longer exist. *Some of these artists have passed on - R.I.P. *Some of these artists play in other, more recent bands. *It's up to YOU to support these artists. *Go to their shows, buy their CDs or use an online music store. *It's up to YOU to participate on The P5 by leaving COMMENTS! Femi Kuti plays the 930 Club in Washington DC 2007. Lost In The '80s Lives On Both Here & At Popdose.com! take the pills - P!O!P like that!